Oil on a mahogany panel. Signed lower left A Doll Munchen. & 1/4 x 12 1/2 inches. Anton Doll (1826-1887). 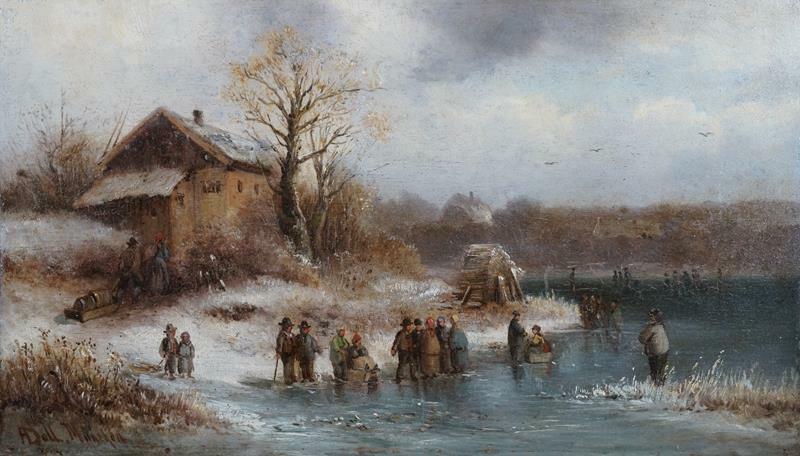 Anton Doll was a German oil painter, watercolourist and draughtsman best known for his romantic, snow-covered landscapes. He was a leading member of the Munich School of painters. His subjects usually include traditionally costumed Germanic people and he often depicted his home city of Munich and the surrounding towns and villages. His cityscapes are studied for their topographical accuracy and are valuable historical records. Doll began by studying law at Munich University but in 1849 turned his attention to painting, making it his profession. He exhibited between 1854 and 1886 at the Munich Kunstverein, in Dresden and Vienna. Collections: Nantes, Munich, Stuttgart and elsewhere.